From the scientist duo behind the New York Times bestselling sensation Does It Fart? comes a new illustrated compendium of animal facts and falsehoods, from the head-scratching to the repulsive! After Does It Fart? comes Number Two...a fully illustrated compendium of animal facts and falsehoods--the more repulsive the better. Do komodo dragons have toxic slobber? Is it true that a scorpion that sheds its tail dies of constipation? Speaking of poo, do rabbits really have a habit of, err, eating their own? 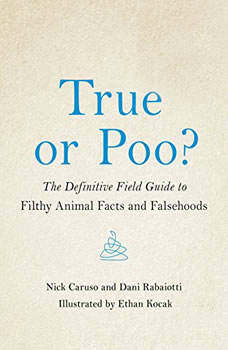 And can you really get high from licking toads, or is that...fake newts?The answers to all these questions and more can be found in True or Poo?, a manual for disgusting and one-upping your friends and enemies for years to come. NPR is going to the dogs in this humorous and touching collection about the animal we call our best friend. Warm, humorous stories from the National Public Radio archives about these furry, inscrutable creatures we live with and love. Humorous, touching stories from the National Public Radio archives illuminate and celebrate our relationship with our furry, feathered, and sometimes scaly friends.